Congrats:) Glad he's doing so well. Such a lovely picture - their little boy is the vision of cuteness. Also, Whitney and Zach look glowing - they seem very happy together. Splendid little family. And He will give His Angels charge over you, to keep you in all your ways. Psalm 91:11 Praying for Zach as he begins this worthy profession that God will protect him under the shadow of His angels wings. Congratulations to Zach on this accomplishment! I just love watching your family on T.V. You have a lovely wife and such a precious little son. Blessings to you and your family! When will their show be available to buy? Can people who don't have cable watch them yet? I think it's the first time I see Bradley serious... :-) He is still adorable, though! What a great opportunity to serve the community! The mission field is right outside our door. May he always be safe. Awww. Precious photo. 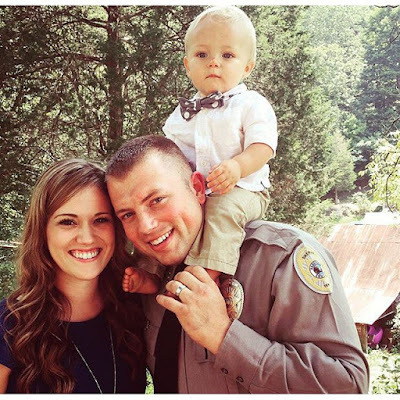 Congrats to Officer Zach & family, & God bless. What a darling little family! So happy and in love. Adore them. Thank you for taking on a profession that can be very hard and dangerous, especially in this present time. Prayers for your safety! You are a great family, prayers to you all! Bradly is adorable, way too cute! Love to you all, Wit included! Congratulations to you and your young family. Wow, in the US you can become a cop in just 3 month??? In my country it's a 3 year fulltime program! How do you become a police officer in 3-6 mons ?? ?